Moroccanoil brand hair products are my favorite that I've ever tried. This conditioner really does a great job at softening my hair and making it look shiny and healthy. It also smells like heaven! Whenever I buy Moroccanoil hair products I only use them a couple times a week because they are so pricey. I'd absolutely repurchase. This is a great drugstore hair mask. It really deep conditions my hair and leaves it feeling soft without weighing it down. I would repurchase. This was in my January Favorites post. It smells great and really does cut down my hair drying time. It also leaves my hair soft and shiny. I love Bath & Body Works foaming hand soaps and already have a ton of backups. This particular scent is amazing! It's a mix of peppermint and vanilla so it kind of smells like a candy cane cookie, yum! This was a nice refreshing body wash with a light citrus scent. Full review here. I don't think I'd repurchase because I like my shower gels to smell more feminine, like flowers or cupcakes or something along those lines. This was in a Caudalie sample set I bought a while back. There was absolutely nothing special about this hand cream. There are drugstore brands of hand creams that are much better. I wouldn't repurchase. This was a very thick body cream that I enjoyed using after I exfoliate. It really softened my skin well but I wouldn't repurchase because I think there are plenty other affordable body creams that moisturize just as well. This was a nice refreshing face scrub. I used this to wash my face in the morning. This face wash also came with a little silicone scrub that you could use to wash your face, I actually used it to wash my brushes. I received this in my February Ipsy Bag. I truly don't like peel off masks. The ones I've tried are just too much trouble with no benefit to my skin and this product was no different. I wouldn't repurchase. This was a nice clarifying cleanser. I used this in the shower and already had a backup that I'm now using. This is my favorite drugstore face cleanser. It does a great job taking off my face makeup and rinses off my skin totally clean (it doesn't leave a slippery residue behind). See my full review here. This is the best mud mask I've ever tried and I've gushed about it enough on this blog! You can read my full review of all the GlamGlow masks here. Because I don't use primer everyday, I've had this for years. I absolutely love this primer. However, I have tons of sample size primers so I won't be repurchasing this anytime soon. This concealer did a decent job at covering my dark circles but it creased. I wouldn't repurchase. 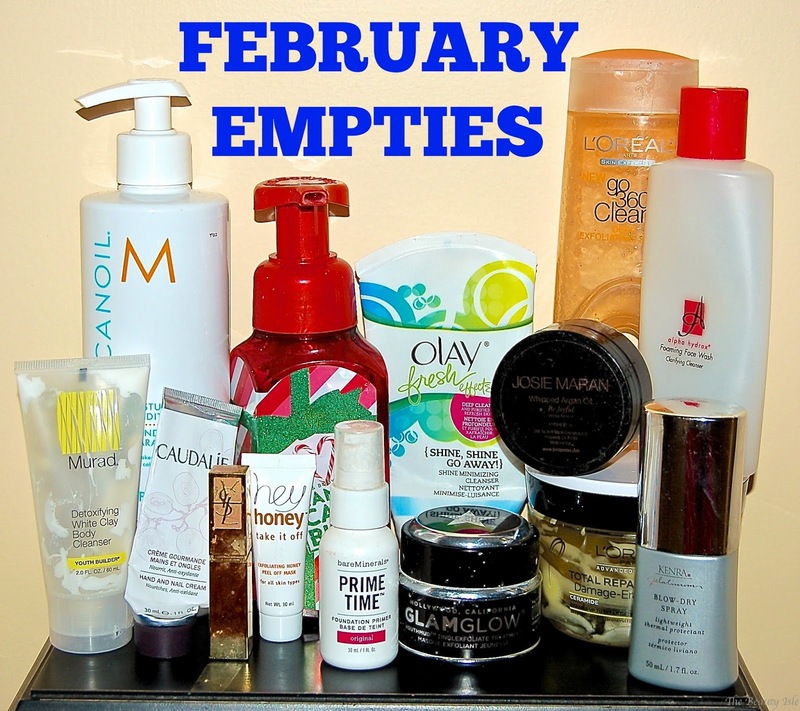 Well guys, those are all my beauty empties for the month of February. Have you tried any of these products? What's your thoughts on them?? Does anyone watch How to Get Away with Murder? What a great show! There are so many jaw-dropping shocking twists!